IVR (Interactive Voice Response) applications offer powerful new tools for your business. Our IVR solutions begin by answering the phone at your toll-free number; every incoming call is logged with its "ANI" (Caller ID) and available to you on your 411XML IVR report. Incoming call logs include the date and time of the call, the ANI, the carrier of the caller's number and the type of phone service (land-line or cellular/wireless). What happens after 411XML call logging is entirely dependent on your business needs. Your callers can be directed to voicemail, transfer the call to your sales or customer service departments, even take product orders. Record your own outgoing messages and receive email and text-message alerts of incoming calls. 411XML reverse-by-phone search can then be used on each call automatically, by clicking on a call in the call log, used to pre-populate a new customer contact record for the incoming call, or create a more complete record of the caller. IVR services begin at $99 setup and $25 per month. Custom hosted IVR application development is available at competitive rates. With our network in the call center and IVR industries, we can manage projects of any size or complexity, each supported by the National Directory Information Services telco-grade data and high-speed, high-reliability service. Skip trace, collections, retail and lead generating services in loans, auto and real estate are finding IVR to be an important and productive tool, especially when supported by real-time multi-source directory assistance data services. One or many toll-free numbers can be assigned to your account(s) (some skip trace companies assign one to each skip tracer). ALL calls to the number are logged and reported on a web dashboard for easy tracking and call management. Caller ID blocking is ineffective. One-click reverse-by-phone search from the call log screen. Accounts can be configured to detect if caller is using a cell phone and prompt for another (home) call-back number. Accounts can be configured to take messages, ring through to your office or offer a choice to the caller. Voice messages appear as an icon that can be clicked on the screen to hear them on a PC; or use our conventional call-in service to hear and delete messages and change outgoing greetings. No busy signals; our system pools a very large number of phone lines. 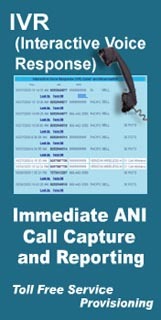 Contact us directly or sign up for our free trial account and see IVR immediate call capture in action.